a bell with a long clapper attached to a wind catcher that plays as the wind strikes the clapper against the bell. The wind chime is a product of many cultures and many times. Bells were first invented in prehistoric times, and the earliest evidence of them dates from 3000 B.C. and was found at archaeological sites in Southeast Asia. By 2000 B.C. , bells had been developed independently along the shores of the Mediterranean and were being cast from bronze by the Egyptians. The ancient civilizations of Asia can claim the musical and artistic refinements of the wind chime as theirs. The Chinese were casting bells by 1100 B.C. , and they created the wind bell that they call feng-ling. Wind chimes were considered religious objects that were believed to attract kind spirits and drive away evil ones. The Buddhists especially revered wind bells and hung them by the hundreds from the eaves of shrines, pagodas, temples, and in caves. In Japan, China, Tibet, and Bali, the religious custom was adopted in the secular world, and many homes were similarly decked with the distinctive chimes. In Japan, wind chimes are called fürin. Where bamboo grows easily, wind chimes made of lengths of bamboo may be even more ancient. In Bali especially, large sets of bamboo chimes are hung in the rice fields where they perform the practical services of startling birds and animals, as well as charming the spirits. Metal sets of tuned, tubular bells were perfected for use in orchestras in the nineteenth century. Precisely tuned, high-quality wind chimes seemed to follow the development of instrumental chimes and have been aided by technology that allows precision cutting and tuning to both ancient and modern musical scales. Wind bells and chimes became a decorative art as well that used a wide variety of materials and ranged from simple to extremely elaborate in size, construction, and ornamentation. The double attraction of sound and appearance helped the wind chime spread to the Western world during the nineteenth and twentieth centuries. Wood tops are sawed, shaped, sanded, and weatherproofed. Holes are drilled through the wood to accommodate support strings. Aluminum tubing is cut using conventional milling process. fasteners or nails, and braided nylon string for stitching the pieces together. The wood can be of many types, and it is treated with oil as the only weatherproofing. Novelty wind chimes are made with brass, bronze, copper, or bamboo tubes. In place of tubes, they may make music with suspended shells, clay pottery shapes, die-cut metal pieces, glass, or other tinkling objects. Their supports and clappers may be equally diverse. Driftwood, metal shapes, and resin ornaments are among hundreds of available choices. Paint, glue, many varieties of string, and hangers of different styles and materials are used for this school of wind chime design. Wind chimes come in every size and shape. The tiniest can be worn as earrings, and another mini model fits in the palm of the hand and has three pipes. The largest has tubes that are 58 in (147 cm) long and resonates like the bells in Big Ben's clock tower. Some are mounted on magnets or plant stakes, and most are hung from ornamental shapes or objects. The emphasis among many designers and manufacturers today is the quality of the sound produced by the chimes. Woodstock Percussion, Inc., began a design revolution in wind chimes in 1979 when the firm began to produce chimes with distinctive sounds and scales that are musically tuned by computer. They looked to other cultures to find historical scales on which to base wind chime melodies and designed chimes with the feel and tone of the chimes of Bali in Indonesia or the Gregorian chant mode. Durability is also an issue because most chimes are designed for outdoor display, so they must withstand not only the wind but sun, temperature extremes, and precipitation. The type of chime described here is a traditional, percussion wind chime made of aluminum tubes, any of a variety of types and shapes of wood as the top, braided nylon string that is used to attach the tubes to their top and the top to the hanger, and metal fasteners or nails to clip the strings to the wood. The wood top is fabricated by cutting it into the selected shape, machining and sanding the cut piece, and treating it with oil to protect it against the elements. Holes are drilled through the wood to allow for the supporting strings to pass through. Four to eight tubes are used in a typical wind chime. Each tube is then tuned with the help of a computer that has been programmed to compare the sound when the tube is struck to the pitches from the original design. If necessary, the tubes are trimmed slightly to adjust the sound. lengths by using a lathe or a milling machine. Four to eight tubes are used in a typical wind chime. Each tube in a precision instrument is then computer tuned; the computer has been programmed to know the material and compare the sound when the tube is struck to exact pitches for the musical scale that, again, is part of the chosen design. If necessary, the tubes are trimmed slightly to adjust the sound. Holes are then drilled near the tops of the cut pipes so they can be suspended; these holes are counter-sunk so there are no sharp, extemal edges. In the assembly area, the wind chime is put together by hand in what is essentially a sewing operation. The braided nylon line is strung through the tubes and the top. The top is linked to the hanger, and the center string assembly is added. At the bottom end of the center string, the clapper is attached; some manufacturers call the clapper a feather or wind catcher. A hang tag is tied to the completed wind chime. The finished product is given a final visual inspection and packaged for sale or shipment. Quality inspections are performed throughout the manufacturing process. Skilled wood and metal workers handle these materials and reject any that have cuts or nicks. In the assembly area, the assembly crew is also responsible for rejecting materials and workmanship that are substandard. The final quality inspection occurs just before the complete wind chime is packed. Wind chime manufacturers do not make byproducts, per se, but they often produce many varieties of wind chime or versions of their designs. They also generate very little waste. Aluminum waste is minimized by careful machining techniques. The small amount of waste aluminum that does result is recycled. Hazards associated with wind chime production are also extremely limited. Like many products with a long history, the wind chime seems to have prospects for an equally long future. Gardening is the number one hobby in the United States, and wind chimes are pleasing accessories for gardens, decks, and patios. The wind chime also experienced a renaissance in interest starting in about 1979 when computer technology began to make it possible to produce an in-tune and truly musical wind chime. The instrument's ties to music and many cultures make it universally loved. Sadie, Stanley. The New Grove Dictionary of Musical Instruments, 1984. Zetlin, Melinda. "A ringing success." Nation's Business (February 1996): 12+. Woodstock Percussion, Inc. http://www.wodstockchimes.com/ (June 29, 1999). Wind chimes or Aeolian chimes are often hollow or solid metal or wooden tubes which are usually hung outside of a building and are intended to be played by the wind, which causes the chimes to strike each other or metal, wood, or rubber balls which may be hung in the center. Wind chimes produce inharmonic (as opposed to harmonic) spectra, although if they are hung at about 1/5th of their length (22.4%), the higher partials are dampened and the fundamental is brought out. This is common practice in high-quality wind chimes, which are also usually hung so the center ball strikes the center of the wind chime's length. Frequency is determined by the length, width, thickness, and material. There are formulas that help predict the proper length to achieve a particular note, though a bit of fine tuning is often needed. Wind chimes are thought to be good luck in parts of Asia and are used in Feng Shui. In Japan they produce pleasant ringing sounds and are hung by the windows during hot humid summers in order to bring cooling relief. Chimes are also made of materials other than metal or wood and in shapes other than tubes or rods. Many people accept bamboo, stones, horseshoes, mechanics tools, PVC pipe, glass, seashells, old silverware, etc., as chimes. Every material makes a different sound. The sounds these make are not tunable to specific notes and range from pleasant tinkling to dull thuds. The idea seems to be that if it is moved by the wind and makes a noise, it is a wind chime. The tone will depend on the material (steel, aluminum, brass, the exact alloy, heat treatment and so on), whether you are using a solid cylinder or a tube, and if a tube, the wall thickness. It may also depend on the hanging method. The tone quality will depend on how you strike a tube (with a hard object or a soft one, for example). Note that with a whistle, such as an organ pipe, the pitch is determined primarily by the length of the air column. It is the air that vibrates. The pipe material helps determine the "timbre" or "voice" of the pipe, but the air column determines the pitch. In a wind chime, the pipe itself is being struck and the air column has little to do with things (especially if the pipe is a solid cylinder!). 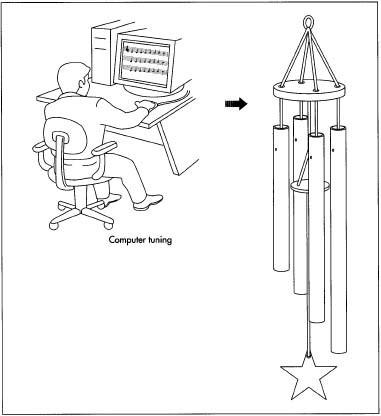 Chimes may be used to observe changes in wind directions. For instance, if a chime is positioned on the north side of the house only a north wind will move it. It may alert the inhabitants to a weather change. Conversely, for a south wind a chime is mounted on the south side. hi can you tell me when wind chimes were first made in New Zealand, who made them and what they were made of, if you can. Thanks heaps.